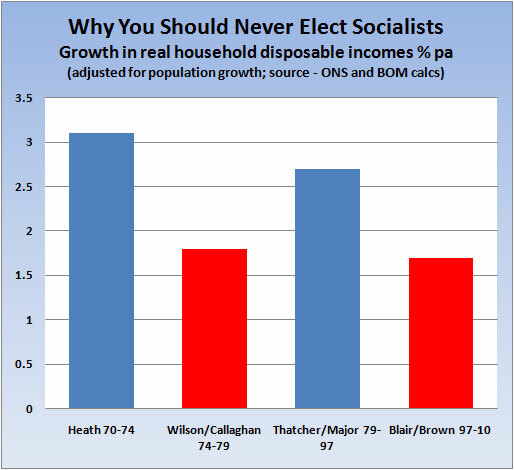 what is socialist ‘new’ labour? Owned by the unions, not interested in business or the poor. Thus ‘New’ Labour undermines and destroys both economy and society. I watch the SNP and Plaid Cymru, and all they are interested in is subsidies for Scotland or Wales. MPs in those regions are elected on generally smaller constituencies, allowing Scots MPs to vote for Scots PMs and Chancellors, who do not have the interests of the whole country at heart. Marxist dogmatism that engenders dependency and class envy. Brown the Clown goes around surrounded by devotees and is protected from real questioners, while Cameron welcomes open questioning. The idea that the SNP and Plaid Cymru really want independence is nonsense. 70% of the Welsh ‘economy’ is government, and much of that is waste. 55% of the Scottish ‘economy’ is government, and 70% of the N. Ireland economy. London is 35% government spending. Give you the right to sack your MP, so you don’t have to wait for an election to get rid of politicians who are guilty of misconduct. Cut the number of MPs by ten per cent, and cut the subsidies and perks for politicians. Cut ministers’ pay by five per cent, and freeze it for five years. Give local communities the power to take charge of the local planning system and vote on excessive council tax rises. Make government transparent, publishing every item of government spending over £25,000, all government contracts, and all local council spending over £500. Gordon Brown’s economic incompetence has doubled the national debt, given us record youth unemployment, and widened the gap between rich and poor. Unemployment is still rising, and this year we will spend more on debt interest than on schools. We need to get our economy moving. Cut wasteful government spending so we can stop Labour’s jobs tax, which would kill the recovery. Act now on the national debt, so we can keep mortgage rates lower for longer. Reduce emissions and build a greener economy, with thousands of new jobs in green industries and advanced manufacturing. Get Britain working by giving unemployed people support to get work, creating 400,000 new apprenticeships and training places over two years, and cutting benefits for those who refuse work. Control immigration, reducing it to the levels of the 1990s – meaning tens of thousands a year, instead of the hundreds of thousands a year under Labour. We face big social problems in this country: family breakdown, educational failure, crime and deep poverty. Labour's big government has failed; we will help build a Big Society where everyone plays their part in mending our broken society. Increase spending on health every year, while cutting waste in the NHS, so that more goes to nurses and doctors on the frontline, and make sure you get access to the cancer drugs you need. Support families, by giving married couples and civil partners a tax break, giving more people the right to request flexible working and helping young families with extra Sure Start health visitors. Raise standards in schools, by giving teachers the power to restore discipline and by giving parents, charities and voluntary groups the power to start new smaller schools. Increase the basic state pension, by relinking it to earnings, and protect the winter fuel allowance, free TV licences, free bus travel and other key benefits for older people. Fight back against crime, cut paperwork to get police officers on the street, and make sure criminals serve the sentence given to them in court. Create National Citizen Service for every 16 year old, to help bring the country together. And that’s even after Gordon Brown has borrowed, on behalf of the UK population, £400 for each man, woman and child in the last one month! Previous rates of household disposable income growth were generally lower in the last four decades under Labour. “Russia must play a central role in plans for a missile defence system in Europe, Nato's top official will tell a meeting of alliance foreign ministers this week. “Nato secretary general Anders Rasmussen believes that bringing Russia into the plans will help to allay its concerns about the project and contribute to further arms control measures, alliance officials say. brown the clown: why do people still smile and shake his hand? With the usual song and dance, ‘New’ Labour launched their dishonest election manifesto at the official opening of a new hospital. The full horror of it, and wrapped in lies as usual. ”But the taxpayer is paying nearly £2.6 billion for it, more than four times what it is actually worth. The QEH is part of what may be Mr Brown's real monument – the Private Finance Initiative [PFI], merely the most catastrophic of the many ways the Government has devised to waste money on the Health Service. The actual cost to build and equip this hospital is £627 million. In case you don’t understand, the purpose in this game is to stop the £627 million appearing on government accounts as a current expense, in order that the Clown’s Labour Party can claim that they are spending/wasting less than is the reality. The government is running large numbers of these Enron accounting schemes, for which you and your children will be paying long into the future, and far more than if the hospital were funded out of present taxation. As you will probably realise, despite these dishonest accounting manipulations, the country is still accumulating incredible amounts of debt beyond the liabilities of these PFI schemes, as Brown the Clown tries to buy the current election. Debt and interest are merely delayed taxation, as are the PFI liabilities. “Labour have subjected Britain’s historic freedoms to unprecedented attack. They have trampled on liberties and, in their place, compiled huge databases to track the activities of millions of perfectly innocent people, giving public bodies extraordinary powers to intervene in the way we live our lives. “We will scrap ID cards, the National Identity Register and the Contactpoint database. To protect our freedoms from state encroachment and encourage greater social responsibility, we will replace the Human Rights Act with a UK Bill of Rights. We will review and reform libel laws to protect freedom of speech, reduce costs and discourage libel tourism. ensuring proper Parliamentary scrutiny of any new powers of data-sharing. “We will be positive members of the European Union but we are clear that there should be no further extension of the EU’s power over the UK without the British people’s consent. We will ensure that by law no future government can hand over areas of power to the EU or join the Euro without a referendum of the British people. We will work to bring back key powers over legal rights, criminal justice and social and employment legislation to the UK. “Unlike other European countries, the UK does not have a written constitution. We will introduce a United Kingdom Sovereignty Bill to make it clear that ultimate authority stays in this country, in our Parliament. “The Lisbon Treaty contains a number of so called ‘ratchet clauses’, which allow the powers of the EU to expand in the future without a new Treaty. We do not believe that any of these ‘ratchet clauses’ should be used to hand over more powers from Britain to the EU. So a Conservative government will not agree to the UK’s participation in the establishment of a European Public Prosecutor’s Office or permit its jurisdiction over the UK. We will change the 1972 Act so that an Act of Parliament would be required before any ‘ratchet clause’ could be used. Additionally, the use of a major ‘ratchet clause’ which amounted to the transfer of an area of power to the EU would be subject to a referendum. The section “Make politics more accountable” is not impressive - no fixed parliaments, no Alternative Vote. “...allow electors to kick out MPs, a power that will be triggered by proven serious wrongdoing. And we will introduce a Parliamentary Privilege Act to make clear that privilege cannot be abused by MPs to evade justice. Wouldn’t these be out anyway if M.P.s were merely subject to the law? This is weak, the second chamber would be all elected by full Proportional Representation.